J.M. Capriola Co. officially opens its doors as a saddle, harness & leather goods store. 1940 Joe Martin and Son, Joe Edward became partners in the Saddle Shop along with Joe Eds wife Rosie. She was the daughter of Tomas Jayo, legendary bit and spur maker for G.S. Garcia. 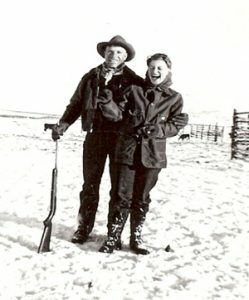 1947 Joe Ed suddenly passes, leaving Joe Martin and his daughter in-law Rosie 50-50 partners. A few years pass and Rosie remarries and sells her 1/2 to her brother Frank Jayo and eventually takes over the business from Joe Martin. 1958 Frank Jayo passes and Joe Martin at the age of 74 years old takes over the business once again. Joe Martin sells J.M. Capriola Co. to Paul and Betty Bear. 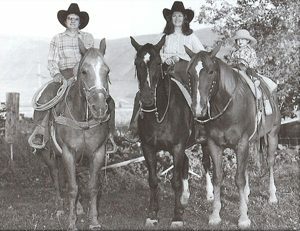 Paul and Betty are buckaroos for the Devils Gate ranch. 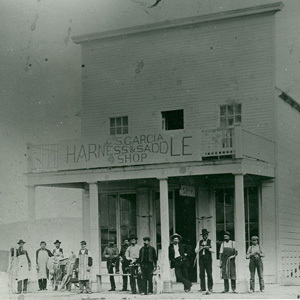 Due to health problems with Paul, the young couple moved to town with their 3 children to run the saddle shop. 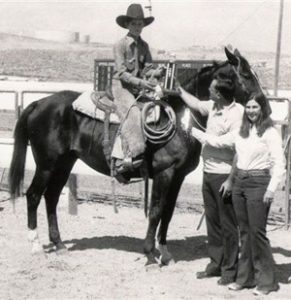 Within a few years the couple also purchased the Fernald Ranch just east of town. Betty remained at this ranch until her death in 2013. 1967 Joe Martin Capriola passes away at the age of 83. 1978 The J.M. Capriola Company buys the Garcia Bit and Spur Company from Les Garcia, son of G.S. Garcia. With this purchase, the Garcia Company is brought back to its home of Elko, Nevada. 1979 J.M. Capriola Company Celebrates its 50th year in business. 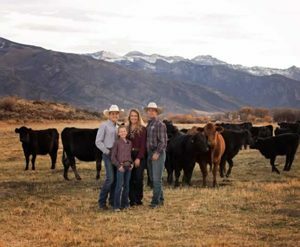 Doug & Paula (Bear) Wright become sole owners of J.M. Capriola Co.
2004 The Legacy of Silver and Saddles book is published. This book details the legacy of G.S. Garcia and the J.M. Capriola connection. 2012 Paula Wright passes in a tragic horse accident leaving the business to her husband Doug and son, John. John and Doug bring John’s wife Susan into the business. 2017 John and Susan purchase the store from Doug Wright. 2019 John, Susan and children, Charlie & Audrey Wright, Grandpa Doug, along with the longtime staff of J.M. Capriola Co. celebrate the 90th year of saddle and gear making.